A Libyan coastguard unit has been filmed destroying a boat used to traffic people by setting it ablaze. The waters between the north African coastline and the EU continue to draw illegal people smugglers in high numbers, while authorities push to prevent it. The incident adds to the maritime force’s already growing reputation for intimidating tactics. In part funded by the EU to keep migrants from reaching European shores, the Libyan naval defense intercepted 1,074 refugees in the Mediterranean on Saturday. The operation saw refugees picked up by the coastguard west of the capital Tripoli, before being transferred to city of Zawiya, Reuters reports. 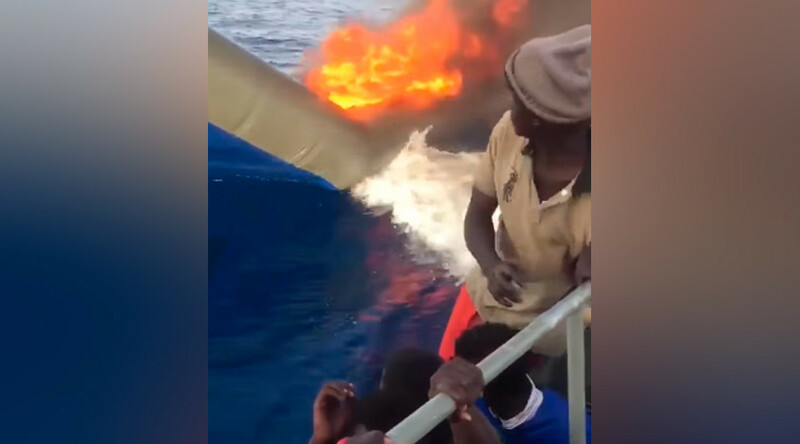 Footage posted to a Facebook page attributed to the national coastguard shows a people-smuggling vessel being destroyed on the Mediterranean by the naval unit. In the clip, scores of rescued refugees look on as the grey rubber dinghy they had been travelling in is set ablaze. As the people are transferred back to land, thick plumes of black smoke rise into the air, potentially sending a message to those seeking to make the same perilous journey. Around €46 million in EU funding has been poured into boosting the capacities of Libyan border patrols. In July, the EU said the money would be largely used in “strengthening” the coastguard of the civil war-hit nation. The financial assistance came in the same month as a UN report saying Libya was a preferred “jumping off point” for migrants and refugees attempting to reach Europe. According to the UN High Commissioner for Refugees, more than 181,000 people travelled from Libya to Italy in 2016. Since receiving EU assistance, the coastguard has been embroiled in a number of controversies, including an accusation that its personnel threatened to shoot aid workers on board a ship chartered by NGO Proactiva Open Arms. Medecins Sans Frontieres also accused the Libyan coastguard of “endangering people’s lives”. In May, MSF worker Annemarie Loof spoke out about how armed coastguard personnel sparked panic at sea when they confiscated the belongings of refugees. “Two Libyan coastguards, wearing uniforms and armed, stepped onto one of the rubber boats. They took phones, money and other belongings from the passengers,” she said. RT.com has contacted the Libyan coastguard for comment.